Originally bred to perform on a minimal amount of food, the Siberian requires less subsistence per pound than other breeds their size. Some will actually monitor their own intake and will pass up on eating a meal here and there. However, some will also acquire a taste for table food and will try to hold out for only table food. The husky will train the owner what to feed, if allowed. 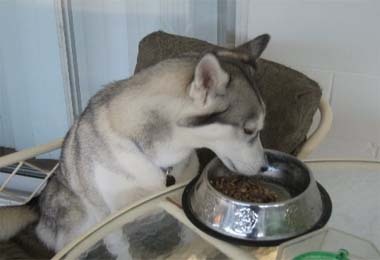 Huskies do require a balanced diet, high in protein and fat. Many commercial dog foods do not meet the dietary needs of the Siberian. While we are on the subject of what Siberians like to eat, lets dispel the myth that Siberian Huskies will never be able to live with a cat. Although they have a very high prey drive, many Siberian Huskies have accepted cats as part of their family. Keep in mind that while the Siberian Husky has a very strong prey drive, they also have a pack mentality. Some huskies will accept cats as part of their pack. However, while they may accept your cat as part of the family, that doesnt mean the catsor the chickens, geese, rabbits, or goatsdown the street are safe if they wander into your husky's sight. You should take the same care with any breed when it comes to other animals. Siberian Huskies are neither the rule or the exception.
" What!..No fork or napkin! And they say I am an animal..hmph!"